In 2015 there will be 21 open gardens in the Elgin, Vyeboom and Bot River districts over two weekends. 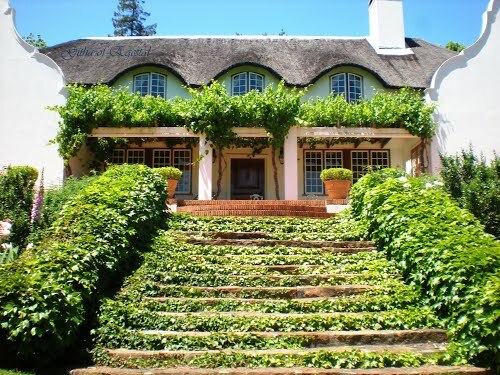 These range from large established country gardens (some over 50 years old), to young, recently planted gardens in villages and on smallholdings, all in a setting of great natural beauty an hour’s drive from Cape Town. New this year is Brookelands, a garden with lovely views set right against the mountains with a couple of dams and a stream arising from an artesian well. The owner is an indigenous tree enthusiast, and has raised many himself from seed collected in the Eastern Cape. Returning this year is Eikenhof, a large garden dating from the 1920s with magnificent trees and shrubs, and beds overflowing with roses and companion plants; and the Stone Kitchen, which shows what can be achieved single-handedly on difficult rocky soil by a gardener-cook who is as passionate about vegetables as she is about flowering plants. A number of gardens will have plants for sale, and some such as Keurbos, Fairholme and Fresh Woods will be offering unusual and interesting plants difficult to find elsewhere. Many gardens are also offering teas and light meals, in addition to the many other restaurants and food gardens in the area. One of the main Elgin charities, Siphila Sonke, will be serving teas and lunches in the Elgin United Church hall along the Viljoenshoop Road, as well as at Eikenhof. Other events in the district include various art exhibitions, such as the exciting installation at Wildekrans Country House by Site_Specific, and the inspiring Botanical Art exhibition at Eikenhof featuring paintings by some of South Africa’s most famous botanical artists. The Elgin Artists’ Group will also be exhibiting at Glenbrae, and Bert Touwen at Lavenham. Other events include a Birding Workshop at Eikenhof, a one hour course on how to attract birds to one’s garden, and the greenhouse tours at Oak Valley. The many wine estates making up the Elegantly Elgin Wine Route will be open throughout the entire weekend, and some of them are planning special events. Full details with a map are in a free leaflet downloadable on this page. The leaflet itself can also be picked up at any major Western Cape nursery from early September on. This is the 14th year of the Elgin Open Gardens scheme. Here in the uplands of the Western Cape, we pride ourselves on the range of plants we can grow in the heavier soils of this cooler and wetter area, in a part of the country also renowned for its fynbos, its fruit and wines, and its nurseries.